I just finished reading the very first profile in "The Bama Way: Profiles of Champions" by former Alabama team captain Todd Bates. I am loving it! The first profile is about a Alabama legend that I had very little knowledge of, however many of the older generation knew him very well (even if they did not follow Alabama football!) He was a great football player who saved Alabama in the 4th quarter from allowing the potential game-winning TD Washington, however he was also very famous as leading movie star who was the hero of an entire generation. He is well known for playing "Billy The Kid" in the movies and was a famous gun slinger. If you don't know much about Alabama history, and even if you do, you will absolutely love this book about Alabama football history. It is definitely a great read. Go to Amazon.com to order. The price is now down to $19.95 and for that price, you are getting a wonderful addition to your coffee table, Alabama room, or library. It is well made and would make a great gift to any die-hard Bama fan. 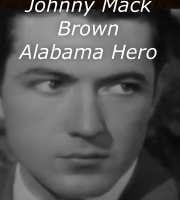 Here is a cool videos about "Hollywood handsome" Johnny Mack Brown from that first championship year at Alabama. "Johnny Mack Brown is best remembered as perhaps the first athlete who successfully pursued a motion picture career. As a football player at the University of Alabama, Brown played in one of the most important games in southern football history. Until Alabama defeated Washington 20-19 in the 1926 Rose Bowl, southern football did not enjoy the prestige it holds today. The 1926 Rose Bowl provided the first opportunity for southern football to gain national recognition. Trailing 12-0 at halftime, Alabama changed its offensive strategy to utilize Brown's pass catching abilities. In the third quarter, Brown was on the receiving end of 61-yard and 38-yard touchdown pass plays. Alabama won the game. Alabama posted a 10-0 record while shutting out eight opponents. Brown's play in the Rose Bowl inspired the game's head linesman to say, "Johnny Mack Brown has the sweetest feet I have ever seen. The way he managed to elude Washington tacklers in his long runs was marvelous. He has a weaving elusive style that is beautiful to watch." After graduation Brown became one of Hollywood's most popular western stars." "In January 1926, after Alabama's first Rose Bowl and National Championship, thousands of Tuscaloosa citizens and University students marched from the train station to the Quad on the University campus. On the historic mound, President George Denny presented every player with an engraved pocket watch. This is video footage from the parade and the celebration on the Quad. Among the players profiled are Pooley Hubert and Johnny Mack Brown."